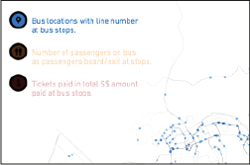 Data provided by the Land Transport Authority enable the accurate monitoring of bus activity at bus stops in Singapore. 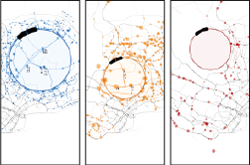 Due to the large volume of data, exploring the information at individual bus stops while also maintaining their geographic context is a challenge visually. 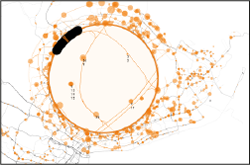 The data lenses proposed here are an interactive visualization tool that address this challenge. The lens acts like a magnifying glass, allowing the user to uncover layers of information that reveal at greater detail the activity of Singapore's bus network. The lens can be dragged over the city’s bus network or remain focused on a set of bus stops. The properties of the lens that a user can modify—the position, size and zoom level—help distinguish even very nearby bus stops. 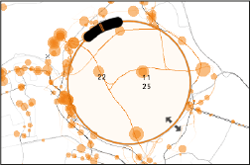 The lens can filter several types of information layers: the line numbers of buses currently stationary at each bus stop, the number of passengers on each bus and the aggregate paid fares by passengers alighting at any one stop. 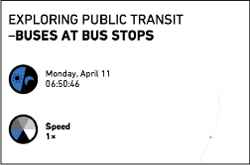 Users can rapidly switch between these information layers to explore correlations between bus lines, stops, waiting times, passenger load and paid fare prices. Designed to visualize real-time data, this application also supports the gradual speed increase between actual time and one-thousand times actual time visualization speed. 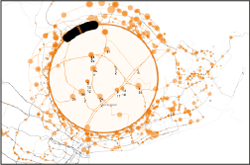 This enables users to discover spatio-temporal patterns of Singapore's bus network in the immediate and over time.